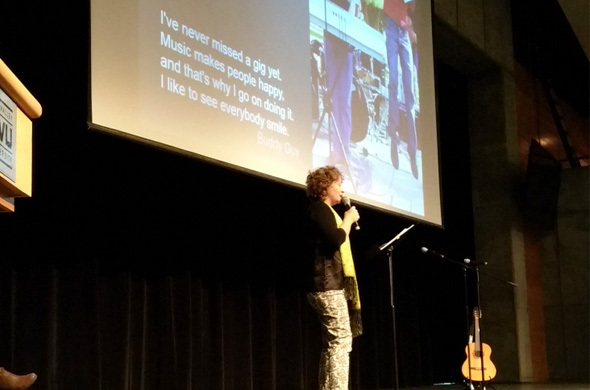 Coast Music Therapy team member Talia Morales, who is also a co-founder of The Songstream Project recently traveled to Utah with local San Diego musician and songwriter, Reid Moriarty and his extraordinary mom and author of Autism Unplugged, Andrea Moriarty. 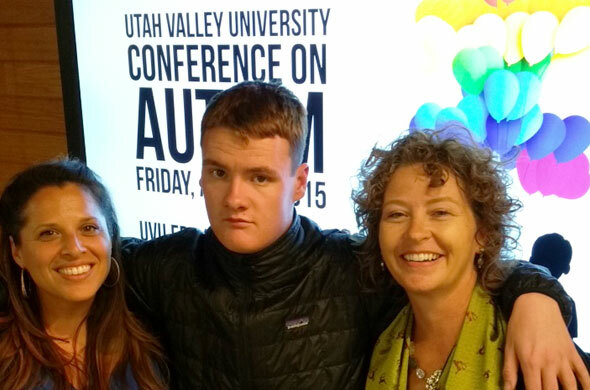 Andrea wrote this blog to share the empowering and inspiring experience they had presenting together at Utah Valley University’s conference for autism in April. One of the things I admire about Coast Music Therapy founder Michelle Lazar is how she cultivates creativity, not just in students, but also in her staff. It is noteworthy how many Coast staff members pursue entrepreneurial or nonprofit interests in addition to their work as music therapists. Michelle supports and encourages their passions, which contributes to such a fulfilling and expressive environment. Case in point: Talia Morales and Vanessa Contopulos, two Coast therapists, along with Michael Fryer and Alex Dausch are The SongStream Project team. Their nonprofit is dedicated to creating spaces where the value of music is amplified, people listen to one another’s stories, and positive change results. As a mobile recording project, they explore the interwoven path of music and memory, story and song. Usually setting up camp in a virtual Airstream trailer to collect stories at farmer’s markets and street fairs, they most recently made an appearance in Utah just south of Salt Lake City. It was my privilege to partner with Talia and speak at the Utah Valley University Conference kicking off Autism Awareness month this April. Our aim was to move autism awareness beyond statistics into story. Statistics don’t move people, stories do. 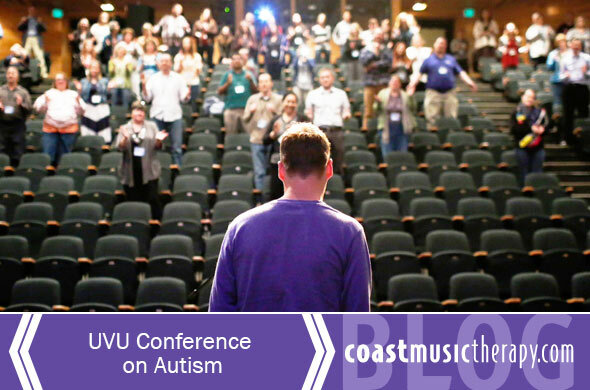 Since music therapy had never been represented as a topic at this conference, we were compelled to go. Coast therapist, Emma Byrd, plays in on the CD on a myriad of instruments from kazoo to bass to vibraslap. She was on hand for the recording process that occurred during her internship at The Music Therapy Center of California. Coincidentally, she knew Reid’s twin sister, Allie, who played flute on the “Red Song by Reid” from Berklee College of Music in Boston. “Purple Party” includes two Bonus tracks where Reid interviews Angela Neve, his music therapist of 13 years. They reminisce and she reveals a number of Songwriting Tips, making the CD a resource for teachers, parents, and other therapists. In addition to his music, Reid now has a bi-weekly Talk Time podcast where he interviews musicians, entertainers and people he finds interesting. It dawns on me afresh that through the Talk Time series, he is actually hearing other people’s stories – whether Angela’s story of becoming a music therapist, gospel legend, Babbie Mason’s of growing up during the Motown era, or Ralph Rubio explaining his first job – reinforcing the truth that The Songstream Project embraces: story and song are intertwined. It is how he has always learned: through the structured, whole brain, strengths-based, intrinsically pleasurable mode of music. After the workshop, the audience was invited to share their stories at our booth. Talia listened in the moment and recorded them to add to the Songstream website. In attendance were a number of individuals on the spectrum; some were students while others ran organizations with remarkable empathy. We couldn’t help but notice a pattern of those who hovered around our booth. I told Talia, “they want to share but they aren’t sure how to get started. It’s like they’re waiting to be invited.” Which of course, we did. Once they got started, a floodgate opened for each one. 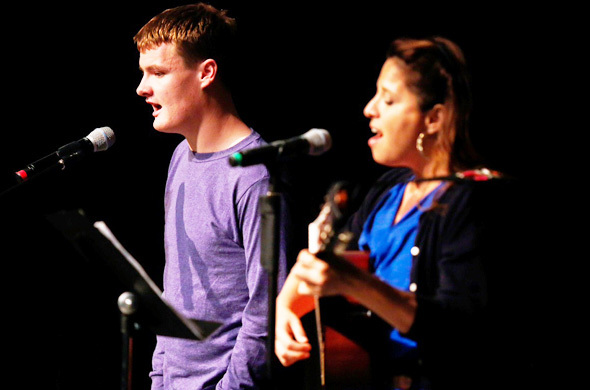 Without exception, they had compelling stories from their childhood about how music had sustained them through the anxiety of high school, inspired them to study music therapy, or how they wanted to incorporate it into what they are doing. I could empathize with their experience; it was moving to enter the sacred space of trust and intimacy The Songstream Project creates by listening. When they entered our living room and listened intently for several hours, I heard my husband say things for first time ever. It was amazing to hear him reframe events from our past and own them in new ways. Maya Angelou says, “There is no agony like bearing an untold story inside of you.” Imagine the loneliness of a world where no one knew your story. Conversely, telling one’s story enables community and connection. That’s what The Songstream Team is cultivating for us and for our children since music makes its possible for them to communicate.